Surprise surprise, this colourful zig-zag beauty is by Zara! My appreciation for the store has somewhat turned into an obsession and now very rarely does a fortnight pass without me entering one of their stores or clicking 'Add to Basket' on their website. Though, as far as obsessions go, there are worse alternatives to having a wardrobe filled to the brim with patterned knit dresses, crisp pastel-coloured shirts and essentials basics, such as the perfect white t-shirt. On this particular day, I was joined not only by an unusually friendly sun (for the month of March, that is), but also an entire family of ladybirds. Perhaps they came out to say hello to their enamel form on my middle finger?! I'm not usually one for quirky rings and tend rather to prefer classic, understated pieces, however I've loved these miniature, quirky nature-inspired shapes by Accessorize for over a year now. It's pretty much a case of 'suns out, fun rings out'. Psst! Discover the products used to create this manicure (as well as tips on attaining better-looking nails) here. I hope the explosion of colourful prints in this post has helped to remind you of how the sunshine-filled, ice-cream-licking days are just around the corner. Though, things will be getting a little chillier on my blog first as I'm in the process of writing up a Scottish travel diary for my stay in Edinburgh. Until then... have a lovely weekend! I really enjoy shopping at Zara as well, it is like the more sophisticated sister of H&M. You are such a doll. Love your dress and + your hair is gorgeous! Have a fabulous weekend ahead girlie! you look stunning in that patterned dress! I love how you paired it with those boots and tights...a perfect transitional look indeed. These photographs are so lovely.... filled with sun and positive energy (not to mention beautiful you) they are really a joy to look at. These photos (AND YOU) are just so stunning! Can't believe that dress is from Zara, the pattern is lovely! Beautiful look! Gabrielle, you are such a natural beauty and the camera LOVES you, you should be a model! I love your entire look, the dress is so pretty and has a lovely retro vibe I love so much! I also love your nails, I remember your post on this design, and those beautiful rings, especially that lady bug one! Thanks so much for sharing, beautiful, and I hope you have a great weekend ahead! This is such a stunning print, and the quality of the piece looks amazing too. Perfectly styled hun! That is such a pretty dress and you look great in it, Gabrielle! 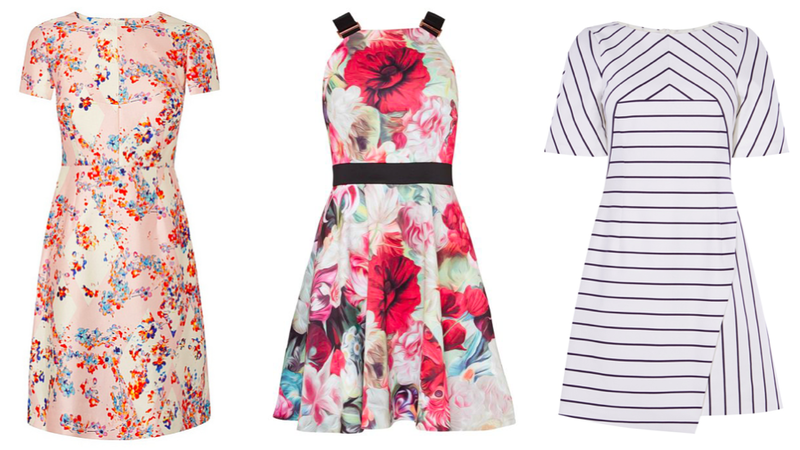 Must admit I have no prints or floral in my wardrobe but I aim to change that this year! Admittedly I'm not a huge fan of prints on myself, but I love the look of the dress. Especially with the high boots too, whenever I think of patterned dresses in the spring I pair them with sandals, but it looks good on you! 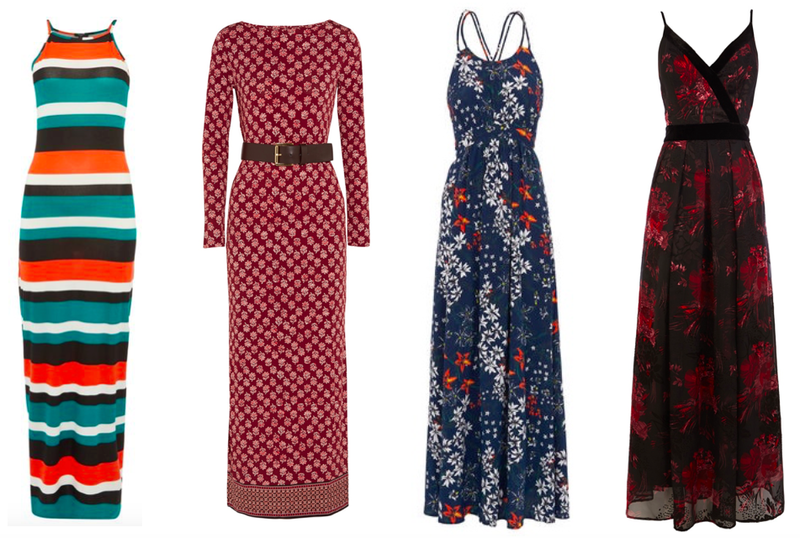 The Bluebell Maxi dress definitely caught my eye too - I love the double strap thing it has going on there. Can't wait to see the Scottish travel diary! That dress is stunning! I love the bold print...gorgeous! Amazing selection of dresses. Sorry to say but i'm copying your nails next time i go to the salon. I like the pattern of the dress! You found the perfect one for you. I'm not usually a huge fan of bold prints but that Zara dress looks gorgeous on you. I love the neckline of the dress as well, from what I can see it's almost t-shirt style which makes the dress so much more wearable for every day in my opinion. As someone who loves bold prints and colours, I'm absolutely in love with this dress. Those dainty rings are so cute. The print is fabulous, I do love a good pattern. Can't wait to see your Scotland pics! Sometimes I shy away from wearing prints but I think they can be really pretty paired with something plain like a basic T-shirt or a denim skirt. Great outfit btw! beautiful photos love the nail art! And your hair is amazing too dear! Beautiful bag! I like your hair ♡ Kisses!! I love both the pattern and colour of the dress and even the material looks stunning too! Loving your nails too; they're so enchantingly beautiful, so dazzling and stand-out! thanks for you sweet comment! have a lovely weekend. Have the same dress and love it. Looking fab and your hair is so gorgeous !!! your dress looks so cute on you. i love it. I live for prints! I love your dress too. I also love understated pieces when it comes to jewellery. Love, love, love the print on this dress. I am so into all the retro inspired prints lately. You look way too cute, love your look! I don't have too many colorful prints like your selection but I love them because they definitely remind of spring and summer that has arrived!! That dress looks great on you! I love your outfit.. The cross body bag is super cute! In love with this dress! The texture and colors make it so unique. You'll get so much wear out of this. The rings are so sweet and look so chic with your manicure! What a lovely dress Gabrielle, it really suits you! A printed dress is such an easy look to just throw on and perfect for so many occasions, whether you are heading into work or going for evening drinks! And it looks utterly fabulous too! Cute look and great colors! Dresses are so fun to wear because they are easy. I'm so jealous of that dress ! Zara does such a lovely range of clothes and those mini nature themed rings were gorgeous I've got to get myself some of those ! Gorgeous dress!! You look beautiful! The print is amazing! Love the print on your dress and the ones you picked out! Such a gorgeous look hun, absolutely love the print and as always you just look stunning!!! Love this dress and the details are just perfect! The print looks great on you. Don't think I could pull off this look like you :-) The photos are beautiful and loving your nails. Super cute dress and bag! Love your rings too! need this bag in my life! That print is so fun! Loving your boots!! So so so pretty ! Love the print of your dress and that little bag! Love this dress. And those are the perfect boots for this look! http://www.lucismorsels.com Luci’s Morsels | fashion. food. frivolity.